This cutie is so cute that I can't stop ogling at it. So cute...right? 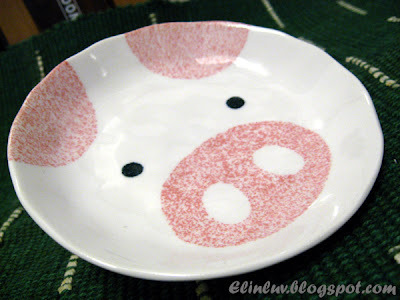 This snack plate with the piggy on it was given to me as a gift from my Piggy Cuz. 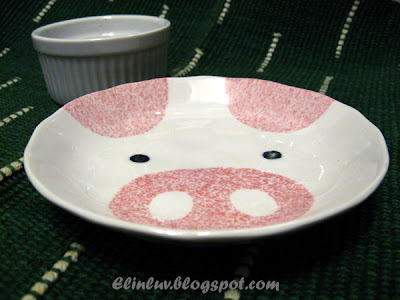 I so love it and thanks Piggy Cuz for this so cute little snack plate. She has instilled in me now to watch out for any cutlery and kitchenware with Piggies design on it lol! For your information , she bought this when she was on holiday and she told me this is the only one left on the shelf ...the one and only and I am so blessed to have this one and only one :)) She does have my interest at heart...always thinking of me and my Piggies and my blog even when she goes for her holidays....I guess food reminds her of me and my blog. So thoughtful of her. Once again, thank you Piggy Cuz for this cutie snack plate :) Okay, I know I have said it many times... I love this and this will join my others props . That's very nice of Piggie! Now you have another piggie prop added into your Piggie-ish family! Btw..I will also buy a book for just one recipe..actually I always did..haha! That's a nice find...especially so when it has such a cute little piggy on it. Oh so cute, so so cute! That is absolutely adorable...I love it!!! nice to meet u! I'm new in ur blog! love ur cooking n ur photo..., so...nice! n love ur plate too...! he!he! :) I love piggy too!